This title couldn’t be more appropriate and timely for Spring, with is worthy and positive theme. Crossing Borders explores what happens in terms of culture and traditions when people move geographically or are forcibly displaced into new environments due to war or other reasons. Not only must the newly arrived group experience a new culture, but communities in a host country need to embrace the arrival of a new culture. It is that coming together which inspires the book: at a time when this subject is more important than ever in our world. 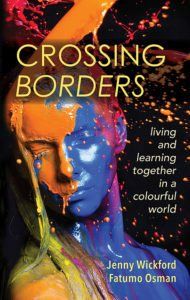 Crossing Borders provides a refreshing viewpoint in an informed but accessible way. Both authors currently work in academic backgrounds and have completed extensive research in the subject, but – importantly – they have both spent years in practical application of their metiers – Fatumo is a nurse and Jenny a physiotherapist. Check back soon for the confirmed launch date.